When you make cold sales calls, you soon become familiar with the experience of prospects who will do anything to get you off the phone. Prospects can get downright creative coming up with ways to get rid of you that don't require them to just say no and hang up. Of course, you also run into plenty of people who have no problem doing the latter, but at least in those situations, you know that the prospect is definitely not interested. On the other hand, prospects who keep coming up with objections but never come right out and say they're not interested can keep you dangling for days or even weeks without actually having a chance of making a sale. Here are some common objections you might hear while cold calling and a few ideas for handling them. This is one of the most common get-me-off-the-phone objections you'll hear while cold calling. If you just say OK and send the information as requested, your chances of making a sale are extremely low. Instead, try saying something like "OK, once you've read through it, how long will you need to make a decision?" And when the prospect gives you a timeframe, say, "Great, then I'll give you a call in [whatever the timeframe was]." That way you've gotten permission to reach out to the prospect at a set date and finally get the sale moving. An even stronger response to the information objection is, "I don't want to waste your time, so before I send you that packet I just need to ask a couple of quick questions." Then proceed with your regular qualifying questions. It's not uncommon for prospects to use this objection to essentially pass the buck on rejecting you. However, it can also indicate that the person you're speaking with is a gatekeeper and really is not authorized to make a decision. You're better off taking prospects at their words and assuming the second possibility is true. You can say something along the lines of, "Thanks, but just to make sure I'm not wasting his time I'd like to ask him a few quick questions. Can you connect me now?" 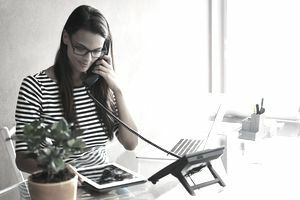 If the gatekeeper counters by saying that the decision-maker is not available right now, ask for their direct phone number or extension or at the very least get the gatekeeper to connect you with voicemail. You'll have a much better chance of actually getting to speak to the decision-maker if you can address them in your own words rather than depending on the gatekeeper's interpretation. It's easy to see this as a buying signal, but it's much more commonly a brush-off. It's highly unlikely prospects will be so intrigued by a two-minute cold call they'll be considering the purchase. Rather, the prospect is probably trying to give the impression of interest so you will happily hang up. The mere fact that they asked for a price so early in the relationship is a red flag. Try saying something like, "I'd be happy to send you a quote. You're confident that this would fit in your budget?" That encourages the prospect to be a bit more forthcoming. Another approach is to say, "Sure, and you'll be ready to proceed with the purchase once you have a formal quote?" That puts some pressure on the prospect to either reject you up front, in which case you'll save some time, or seriously consider the purchase.